With their unique centerfree design, annular cutters cut only the periphery of the hole, ejecting the remaining center as a slug. These cutters produce reamed quality, burr-free holes in one operation, eliminating costly pilot holes and step drilling. Our cutters reduce torque and horsepower requirements by only cutting the periphery of the hole using the proper tooth geometry. We carry a complete line of annular cutters. Please ask if you need quantity pricing or package pricing. We will include shipping and offer competitive prices. Thanks. One way to avoid dimpling and deburring while making holes in tube and pipe is use annular cutters. 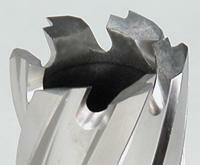 Because annular cutters are hollow, there is no dead-zone resistance to overcome. Knowing how to use an annular cutter and what to watch for can help avoid problems and extend tool wear. Knowing how to use an annular cutter and what to look for can help you avoid problems and extend tool wear. What causes annular cutters to break or dull prematurely? The primary cause of broken or prematurely dull cutters is a feed rate that is too slow. Slow feed rates will reduce the life of your cutter. Using a firm, steady feed pressure throughout the cut will maximize performance and extend tool life. Why do you have to clear chips from the cutter before every cut? As the cutter begins removing material, new chips flow out through the gullets and up the flutes. If these pathways are not cleared before cutting a new hole, packing or binding may result, causing the cutter to fill with chips and possibly break. When do you use a magnetic drill? It can be time-consuming and cumbersome to try to jockey a large pipe into position at a stationary drill press or work center. A portable magnetic drill allows you to take the drill to the workpiece, instead of trying to bring the workpiece to the drill. A portable magnetic drill press also may be used in any position—vertical, horizontal, or overhead. The workpiece must be at least 3/8 inch thick. Is the magnet on your portable drill press strong enough to drill pipe? When you’re using a portable drill press, a support system is needed. A safety chain or strap is also recommended, in case the magnet slips from the support. When you are using a magnetic drill and pipe adapter accessory, mount the adapter securely to the pipe with a tightly wrapped chain (see lead image). Make sure the support system for the drill arbor is rigid and in good condition. How do you keep your magnetic drill from slipping? Make sure the drill’s magnetic base is clear of chips and debris and is securely attached to a clean workpiece. Uneven surfaces or large debris buildup prevents the magnet from obtaining optimal holding power, which can cause the drill to shift or lift during operation. A safety chain or strap also helps to prevent injury if the drill shifts. If it does shift or lifts during the cut, and the motor is not stopped, the cutter will break. A good magnetic drill will have a built-in safety circuit that stops the motor immediately when the drill lifts from the material. What is the purpose of coated cutters, or cutters made from premium steel? Cutters made from M2 high-speed steel (HSS) are recommended for materials with a Brinell hardness number (BHN) of up to 275. A titanium nitride (TINI) or similar coating may be applied to M2 to fortify wear resistance in materials up to 325 BHN. For materials up to 350 BHN, cobalt steel (M42) is recommended with a titanium nitride or similar coating. What makes the slug stick in the cutter? Using lubricant or cutting fluid helps the slug to eject at the end of the cut. But when slug ejection becomes unreliable or the tube resists cutting, it probably means the cutter’s cutting edges are becoming dull. Resharpen or replace your cutter. Always use some form of coolant when drilling to maintain cutting performance and tool life. Any form of coolant or lubrication helps.